As the craft beer movement rages on, airlines are beginning to catch on, with some going so far to offer passengers local craft selections in the sky. "You can actually get a decent drink," says Anthony Caporale, director of beverage studies at the Institute of Culinary Education in New York via the Associated Press. "I started a few years back seeing small-batch bourbons on flights. Now I think it's uncommon for me to get on a major airline that doesn't have some sort of craft American whiskey." Nowadays, many carriers, including notable airlines like Virgin America and Delta Air Lines, take unique approaches to inflight cocktails. Examples include Virgin's cucumber vodka mojito and Delta's "Jack and Joe" whiskey and coffee combination. 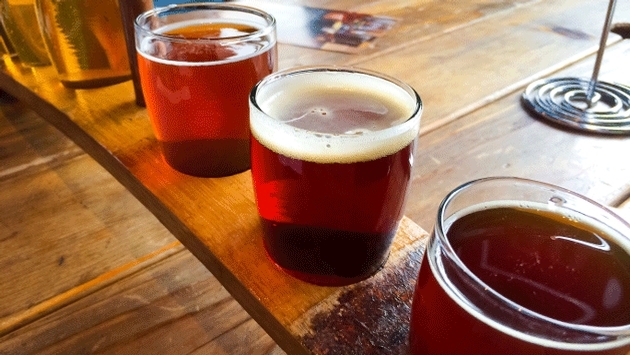 Craft beer popularity has even led some airlines to implement a rotating seasonal selection of brews. JetBlue and Southwest Airlines recently joined forces with Wisconsin-based brewery Leinenkugel in an effort to bring passengers more variety. In addition to enhanced selection, technology has simplified the ordering process aboard most carriers. The hope remains that both quality and pricing will share the same encouraging trend. "I would guess as we see an increase in the better-quality pre-mixed cocktails on the ground like the Crafthouse brand, we'll begin to see more of them in the sky," says Camper English of Alcademics.com via the AP. Still, narrow aisles and a pressurized cabin will always present seemingly unavoidable difficulties when it comes to both serving and enjoying a cocktail. Thankfully, English points out that fast-improving airport bars and lounges are an excellent Plan B.